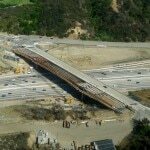 Today my favorite pilot, my brother Alain, flew me over the closed 405 freeway to see the progress on the demolition of the Mulholland Bridge. Over the past few days, this Los Angeles event has become nationwide news. I have to say it was very impressive to see the 405 empty of regular traffic. I hope that the drivers of the few cars and trucks that were circulating on it enjoyed their ride, and must feel privileged — and they should. Watch my video to get some great views of the almost demolished bridge. 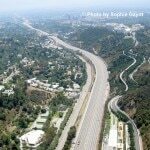 From the air, it looks like it will be fine for the reopening of the 405, until next year when the other side of the Mulholland Bridge will have to be destroyed! 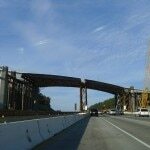 Partial and full freeway closures continue intermittently. 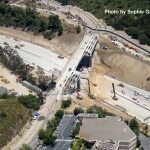 Construction of the new Mulholland Bridge is expected to be complete by summer 2012. You can click on each photo to enlarge. Photos by Sophie Gayot.